FC Barcelona have run up some staggeringly high scores in recent derbies against Espanyol, and tonight’s edition was no exception. The visiting net was struck five times, with Leo Messi getting the first three. What's more, the home crowd was also treated to a preview of the kind of magic that Ousmane Dembélé will be bringing to the team. The big summer signing started on the bench as coach Ernesto Valverde opted instead for an MSD featuring Gerard Deulofeu. And Barça made it clear right from the start who was in charge, with Espanyol barely crossing the halfway line in the first 25 minutes. All the same, other than a couple of half chances, the blaugrana had produced very little before Ivan Rakitic, his fitness concerns forgotten, slipped a perfect through ball to Messi. The Argentinian slotted home with class … albeit also with a touch of fortune that the linesman hadn’t spotted that he was marginally offside. Ten minutes later, Barça doubled their lead and again there was an element of luck involved. 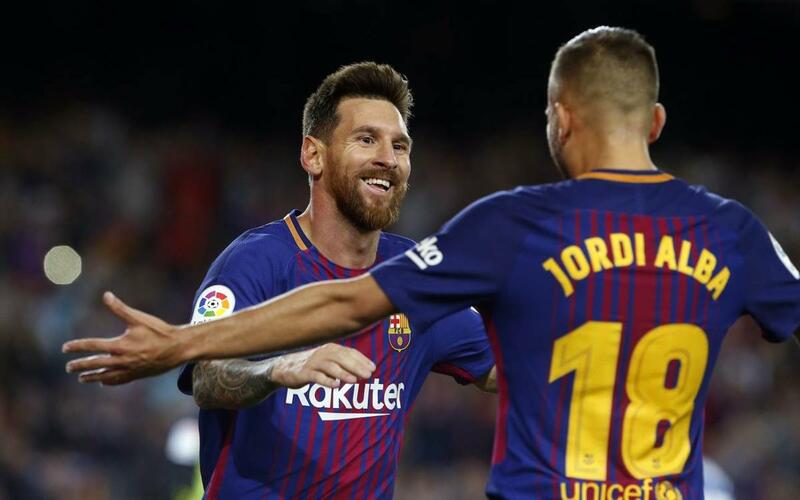 Messi lost the ball as he penetrated the Espanyol area, but it bounded straight into the path of Jordi Alba and then back to Leo, for whom it was now just a simple matter of stroking home his second of the night. That seemed to have wrapped up the derby after just 35 minutes. But although Barça continued to pile on the pressure, it was Espanyol who came closest to adding to the first half scoring. Pablo Piatti had Ter Stegen well beaten, but his powerful strike rammed the ball onto the post. The same man really should have buried another chance on 50 minutes, but otherwise Barça always looked the more likely side to score, with Luis Suárez letting two golden opportunities go begging. And when the third goal finally came it was that man Messi again, completing his 38th club hat-trick by pumping home another Alba assist. The third goal came with the French national anthem ringing out around the stadium – and a fine rendition it was from the home fans. The motive was their eagerness to get a first glimpse of Dembélé in action and they finally got their wish on 67 minutes when the 20-year-old replaced Deulofeu in the Barça frontline. Moments later, the Camp Nou was able welcome on another player for his home debut as Paulinho came on for Sergio Busquets – and very nearly celebrated the occasion with an 80th minute goal. But there were more goals to come – two in fact. First Gerard Piqué powered his way through to head home a corner with five minutes left on the clock. And right at the end we got to see what the hype was all about. Andre Gomes started the move and it was Luis Suárez who put the ball in the net, but the goal was all about Dembéle’s tremendous show of flair down the right and his inch-perfect delivery to the Uruguayan. On a day that defending champions Real Madrid were held at home by Levante, things are starting to look very positive indeed at the Camp Nou! Nine points, nine goals, and none conceded. Força Barça … now bring on Juventus!